Lateral epicondylitis. commonly known as “tennis elbow.” is an inflammation of the tendon fibers that attach the forearm extensor muscles to the outside of the elbow. These muscles lift the wrist and hand. Pain may be felt where these fibers attach to the bone on the outside of the elbow or along the muscles in the forearm. 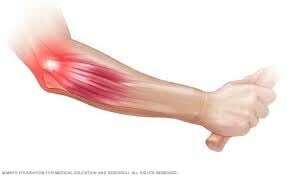 Pain is usually more noticeable during or after stressful use of the arm. In severe cases, lifting and grasping even light things may be painful. Because people who play tennis or other racquet sports sometimes develop this problem from improper playing technique, it has become known as “tennis elbow.” Medial epicondylitis or “golfers elbow” is a similar condition that occurs on the inside of the elbow. Routine use of the arm or an injury to this area may stress or damage the muscle attachment and cause tennis elbow symptoms. Generally, people who develop this problem may be involved in activities with motion of the wrist and arm or lifting with the palm side of the hand facing down. The condition is quite common in our late 30s and early 40s. The area of most pain is usually found near the bone on the outer side of the elbow known as the lateral epicondyle (see Diagram). This area is usually tender when touched and may be uncomfortable when gripping. In severe cases, almost any elbow movement can be uncomfortable. Treatment may include stopping or limiting activities that cause the pain, such as heavy lifting with the palm facing down. Sometimes a band wrapped around the forearm near the elbow is used to protect the injured muscles as they are healing. In some cases, the wearing of a wrist splint may be recommended for the same purpose. Anti-inflammatory medication, can be taken by mouth. In severe or long-lasting episodes, an injection of medication into the area may relieve the discomfort. Your hand surgeon may recommend exercises that stretch and strengthen the muscles to help prevent the condition from returning. Some patients respond to additional treatment through therapy. As the condition improves, there is usually a slow return to normal activities. Recurrence of this condition is common. If nonsurgical forms of treatment do not eliminate the pain of this condition, surgery may be recommended. Your hand surgeon may recommend exercises that stretch and strengthen the muscles to help prevent the condition from returning. Some patients respond to additional treatment through therapy. As the condition improves, there is usually a slow return to normal activities. Recurrence of this condition is common. If nonsurgical forms of treatment do not eliminate the pain of this condition, surgery may be recommended. Your hand surgeon can advise you on the surgical treatments for lateral epicondylitis and the possible outcomes. Lateral epicondylitis is often a nagging or chronic condition sometimes requiring many months for healing to occur. Tennis elbow is localized to the area where the extensor muscle is attached to the lateral epicondyle (see Figure 1).